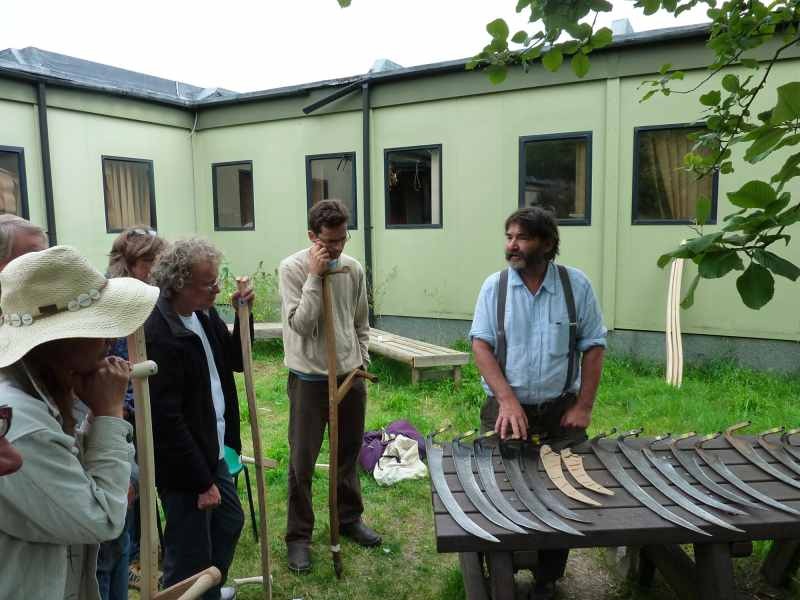 permaculture in brittany: Learning to Scythe with Simon Fairlie. 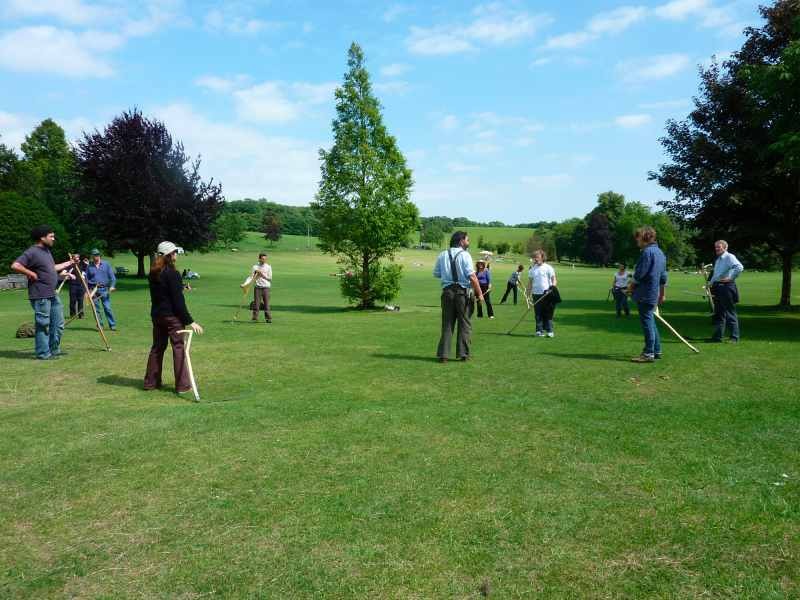 Learning to Scythe with Simon Fairlie. A few years back, I sold our fully functioning petrol strimmer and with the money bought a pair of ash-handled scythes with razor-sharp Austrian blades. I don’t think we’ve done too badly since and (sharpening aside) it’s always ready to go and one’s never caught short for lack of fuel, 2-stroke oil or strimmer string. 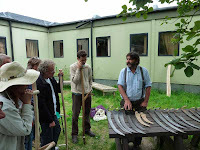 Like most things, though, there’s only so far book and video learning can take you and so I recently signed up for a scything course hosted by Brighton Permaculture Trust and run by Simon Fairlie, vendor of our scythes. Tai Chi, with sharp knives! After the classroom stuff and an interesting history of the scythe, we ventured out onto the closely cropped lawns of Stanmer Park. The idea wasn’t to cut anything but to practice the moves: think of a Tai Chi group wielding machetes. Although it wasn’t the aim of this particular exercise, it was satisfying to see tiny green shards displaced by a well executed pass. 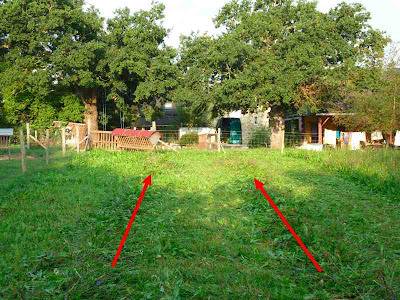 We then moved onto an area with grass around six inches high to mow. There were arboreal obstacles and slopes and, while I wondered whether a flatter, more even surface might have been more inviting for our first efforts, this was a ‘real life’ scenario. Simon and his two assistants wandered carefully among us, offering advice and honing our blades. 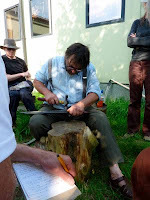 More classroom stuff, including the importance of peening and honing to keep the blade sharp. 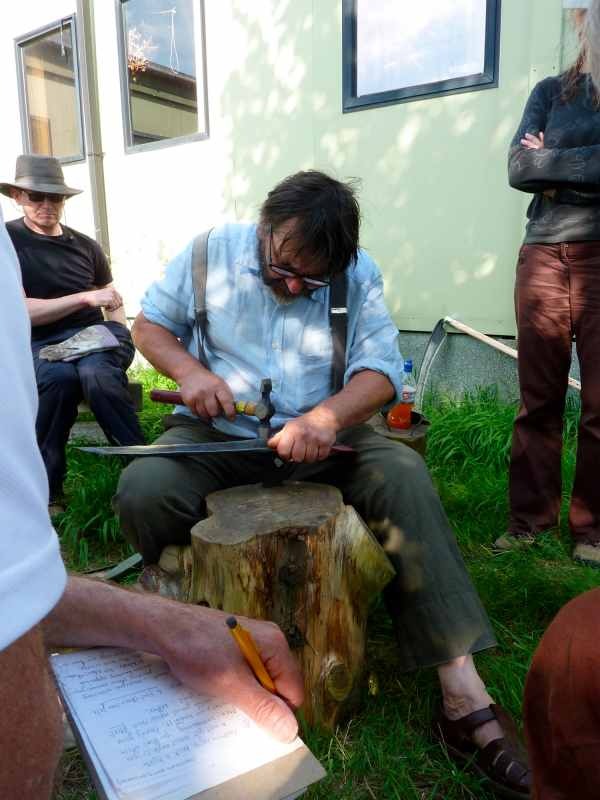 Learning how to get the blade to the required sharpness and maintain it is as essential as learning how to scythe properly. Even with a good technique, scything with a blade that needs sharpening is hard work and puts unnecessary strain on the wooden snath (handle) but if the blade is really sharp, you can cut grass even with a less than perfect stroke. 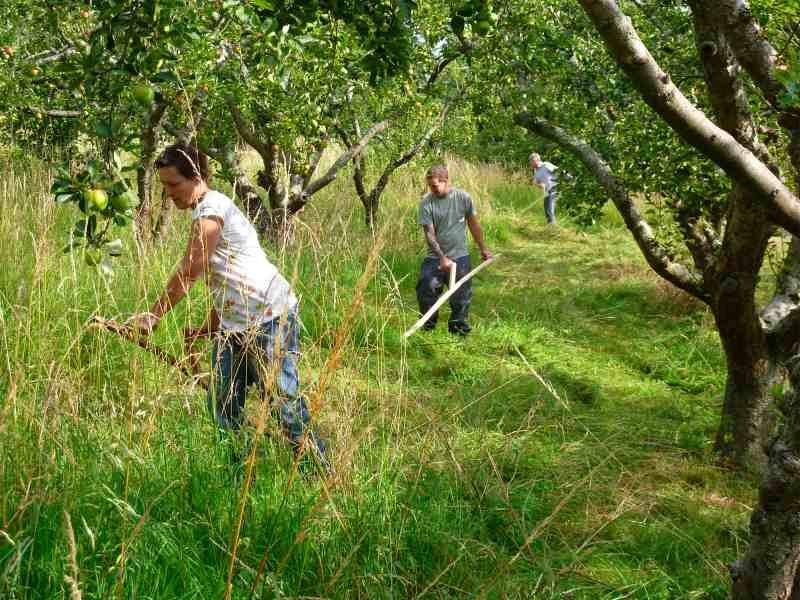 For the second day, we were invited to start at 7 in the morning and I think even Simon was impressed by how many of us managed to roll out of bed early enough to join him in a community orchard with the dew still on the grass. In ages past, a team of scythesmen would start work before daybreak. There is more moisture in the plant and so the stems are stiffer and thus easier to cut with a swing of a scythe. Once we’d tidied up the orchard, Simon showed us how to make a rack out of a couple of A-frames to dry the cut grass into hay. He then gave us a very useful talk on managing grassland to feed stock throughout the year, the spring excess saved as hay to feed through the lean months of winter. Since I came home from that trip ‘abroad’, I’ve taken to a new regime, getting out of bed earlier and doing half-an-hour’s scything before breakfast. I’m getting better at peening and honing and regular practice is improving my scythe strokes but I’m not sure how long I can keep getting out in the field so early. The rewards are great as the exercise and deep breathing (out through the mouth on the cut, in through the nose on the return) feels good and seeing the morning sun wash over the oak trees while being serenaded by birdsong is sublime. Buy your scythes and accessories from Simon Fairlie’s TheScythe Shop. The Vido family showing us how it should be done. The scythe doesn't drown out the wildlife or damage your hearing either. I still have the petrol strimmer as I can't cut brush with the scythe but love using the scythe when I can. For larger areas the scythe knocks spots off the strimmer in every respect weight, speed, noise and general feeling of smugness at not using petrol. Understanding how to sharpen the blade is worth the course in itself I would think. I'm laid low with a bad back, thanks to trying to help a friend move a very large and very ugly repro duke box so have been slogging my way through my inbox. That's my excuse for not replying to your comments earlier. Thank you for stopping by to leave a comment, I always appreciate them. Phil, the sharpening is critical and so, yes, I'd agree the course is worth going on just to be shown how to set up the scythe on its snath and sharpen and hone it. dND, my handle (snath)is made out of ash, so is very light. I know the ones you're referring to, which don't allow (as far as I can see) for one to get one's hands in the correct position. You should be able to cut brush with a scythe if you have the right sort of blade, that it's correctly sharpened and the hafting angle is quite sharp (so you cut a thinner slice with each sweep) giving the scythe an easier time with such hard material. 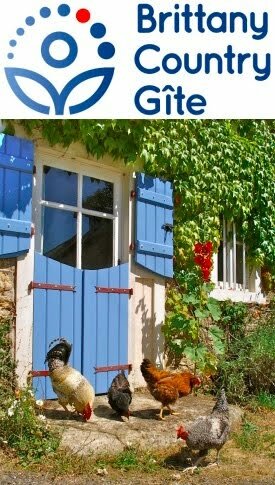 If you can combine a trip to the UK with a visit to Simon Fairlie, do so; yuou won't regret it!